On three separate occasions in the past four days, Wisconsin Governor Scott Walker, one of the frontrunners for the Republican presidential nomination, has stressed the close connection between the struggle against the working class at home and Washington’s militarist policies internationally. Linking the suppression of workers’ protests to the fight against terrorism, he has presented his success in defying mass demonstrations that broke out in 2011 in Wisconsin against his attacks on workers’ social and democratic rights as proof of his ability to take on and defeat ISIS. Speaking Thursday at the Conservative Political Action Conference (CPAC) in suburban Washington DC, Walker cited his experience in pushing through anti-worker legislation as proof of his fitness for the presidency. “If I could take on 100,000 protesters, I could do the same across the world,” he boasted, effectively comparing throngs of state workers and students to ISIS terrorists. Appearing two days later on “Fox News Sunday,” Walker repeated his claim that defeating public employee unions in Wisconsin was relevant to fighting ISIS terrorists, while pretending to disavow a direct comparison. “I want to make it clear right now. I’m not comparing those two entities,” he said, and then proceeded to do just that. Walker’s initial statement at CPAC was widely described in the media as a gaffe. The problem, however, was not his implicit equation of working-class opposition with terrorist organizations that have been targeted for extermination, but rather his indiscretion in blurting out publicly what the US corporate-financial oligarchy thinks and discusses internally. In the event, comparing public employees to ISIS terrorists has not disqualified Walker in the eyes of the media. If anything, it appears to have enhanced his stature as a serious presidential candidate. This is certainly the case among the so-called “base” of the Republican Party that attended CPAC. 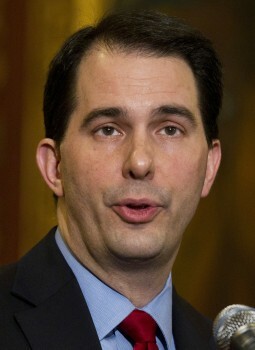 Walker won the loudest ovations of any of the 13 potential candidates who addressed the group. In the CPAC straw poll, Walker vaulted from sixth place in 2014 to second place, with 21.4 percent of the vote, only narrowly behind Kentucky Senator Rand Paul. As the WSWS noted Saturday, Walker is not the first US political figure to equate the struggle against popular opposition at home with the wars waged by American imperialism overseas. In the American ruling elite, whether among Republicans or Democrats, there is less and less of a distinction made between domestic and foreign policy. The financial aristocracy increasingly sees itself besieged and compelled at home as well as abroad to resort to force and violence. Events of the past several years demonstrate that for the American ruling class, the main enemy is at home: the jailing of protesters on terrorism charges, such as the “NATO Three”; the lockdown of Boston after the 2013 Marathon bombing; the militarized response to protests in Ferguson and other cities over police violence; the constant invocations of “home-grown” terrorism as the pretext for the dismantling of democratic rights and the buildup of a police state. There has been comparatively little media attention given to Walker’s open linkage of suppressing strikes and protests at home with waging war for imperialist interests abroad. The television networks and national newspapers prefer to leave such discussions to in-house assemblies of the ultra-right and conclaves of the corporate elite. There was one revealing commentary, however, posted by right-wing columnist Peggy Noonan, on the web site of the Wall Street Journal. Noonan, a White House speechwriter in the Reagan administration, responded to Walker’s invocation of the PATCO strike as a historic turning point that showed the Soviet Union Reagan’s determination to smash opposition to his policies. She noted that the PATCO strike had a direct international dimension, since Canadian air traffic controllers carried out job actions in sympathy with their American colleagues and there was widespread support among European workers. The Reagan administration bullied the Canadian government to force a return to work. Noonan then wrote: “Sen. Edward Kennedy and Lane Kirkland of the AFL CIO played helpful and constructive roles” in support of Reagan’s handling of the PATCO strike. What Noonan noted in passing was a devastating admission, confirming what the Workers League, forerunner of the Socialist Equality Party, and our newspaper, the Bulletin, explained throughout the 1981 strike: the outright hostility of both the Democratic Party and the AFL-CIO officialdom to the struggle of the 11,000 strikers, who had enormous support in the working class. Kennedy had spearheaded the deregulation of the airline industry in the late 1970s and it was one of his aides, working in the Carter administration, who drew up the plans for strikebreaking and mass firings in the event of an air traffic controllers strike, eventually implemented under Reagan. Kirkland played the central role in the AFL-CIO’s deliberate isolation of the strike. After a mass rally brought 500,000 workers to Washington on September 19, 1981, the biggest labor demonstration in US history, led by thousands of PATCO strikers, the unions shut down all support, blocked any solidarity strike action by airline or airport workers, and tacitly supported the jailing of strikers and the outlawing and destruction of PATCO. It is critical that workers entering into struggle, such as the US oil refinery workers now in the second month of a bitter strike, carefully consider the significance of Walker’s statements as well as the record of the Obama administration in overseeing the buildup of the forces of state repression. The ruling class will stop at nothing to defeat the resistance of workers to its assault on living standards and social conditions. It recognizes in the working class its irreconcilable enemy. The working class must respond with the same degree of consciousness, determination and ruthlessness. The PATCO precedent remains of decisive importance today because the twin obstacles of the AFL-CIO and the Democratic Party remain the decisive barriers that the American working class must overcome in order to build a mass independent political movement that will challenge the profit system and advance a socialist and revolutionary program.